...a collection curated by Eden Cottage Yarns. Today is an exciting day my friends, for we can finally unleash upon you our lovely new Drift collection. After around ten months of work, photoshoots weekend after weekend, an awful lot of test knitting and crocheting, and a vast amount of editing on Clare Devine's part, we are happy to set it free! Let me just tell you that you can see the full collection, with all the photos including 'on location' at most of the photoshoots, in our lookbook. You can also see, queue, favourite, and cast on all of the projects on Ravelry HERE (I won't keep repeating the same link). And I'll be talking in more detail about the individual pieces on the blog, over the course of the week or so after Yarndale. Talking of Yarndale, this collection will debut there - come and see and try on the pieces, and squish the yarn - we are on stand number 11 which is along the far wall nearest the knit and natter lounge. Book preorders - you can pre-order your print copy of the book HERE now, and they will be dispatched on or before the 9th of October. They will be available in print at Yarndale (you can pick up your copy there - just choose that option on the website when it gives you shipping options), and then they will be available in print on the website from the 9th of October. 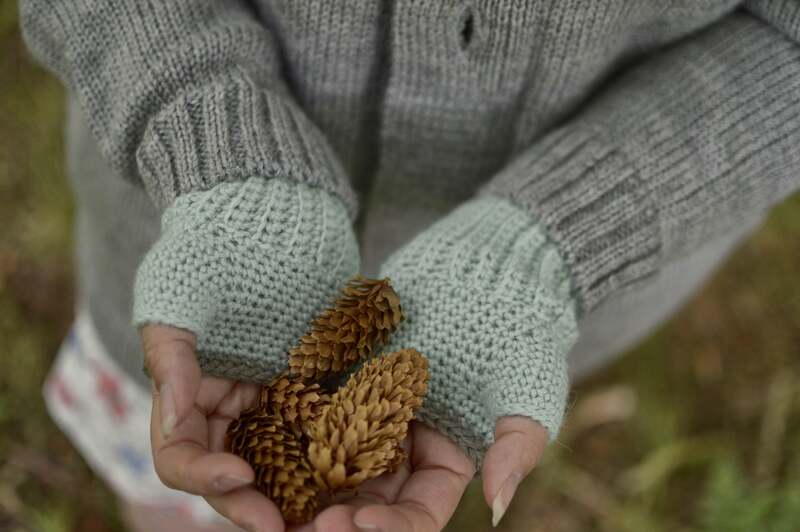 I've already told you a bit about the collection: it uses Whitfell DK (our lovely baby alpaca), it includes accessories, adult garments, and a child's garment, and it includes crochet as well as knitting.. So now I will show you what we've got! Cloudburst by Dieuwke van Mulligen This is a gorgeous top down raglan sweater, with subtle openwork detailing over the right shoulder and left hip. It's shown here in Misty Woods. 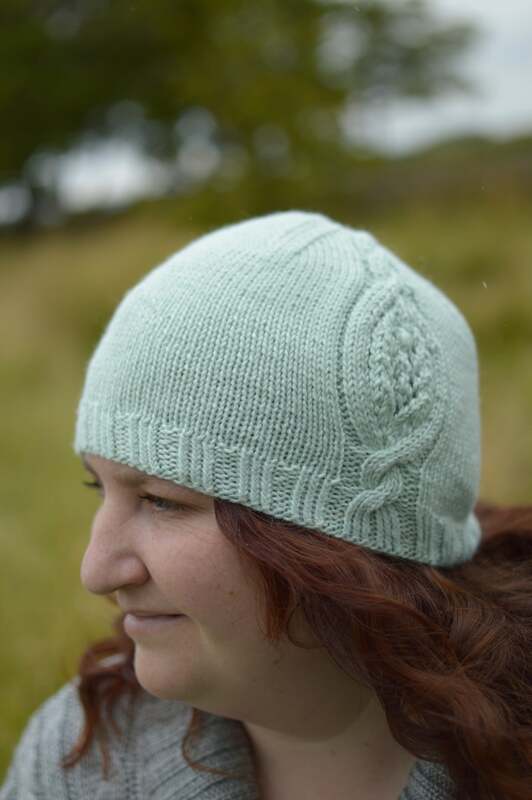 Pimms Cup by Thea Colman This is a slouchy hat with a rich lace pattern; it's a great fit (seems to fit everyone!) and I think it works perfectly with a bobble. It's shown here in Dogwood. 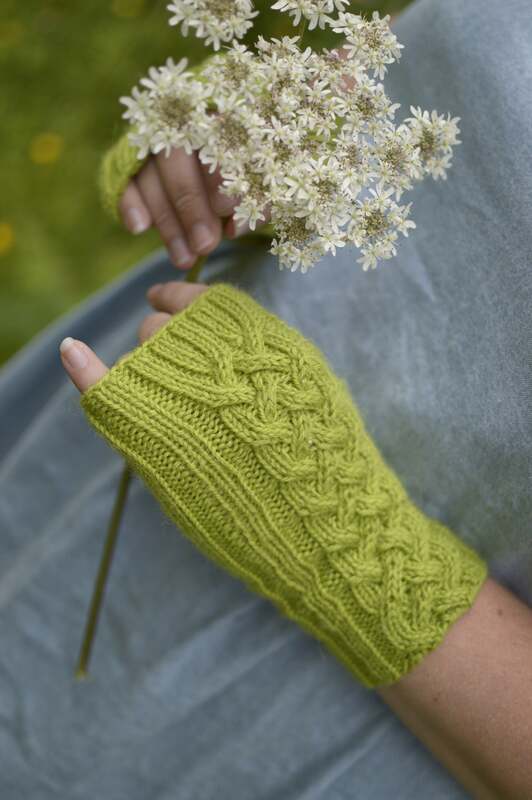 Hardcastle by Louise Tilbrook These sumptuous cabled fingerless mitts are really pretty and perfect for cooler weather - I can't wait to start wearing them (it's *almost* cold enough!). The ribbing around the palm also means that they're a really flexible fit - they can fit narrow hands but stretch loads too. They're shown here in Lichen. Deco Swirl by Louise Zass-Bangham This is a gorgeous, light autumn knit, with a really cool graphic stitch pattern. It's really nice to wear with a dress, but will look smart with a jacket as well, I think. It's shown here in Fuchsia. Beulah by Clare Devine Another gorgeous hat with a cable and lace panel, and really cool crown decreasing (more pics to come, and more pics on the Ravelry page). 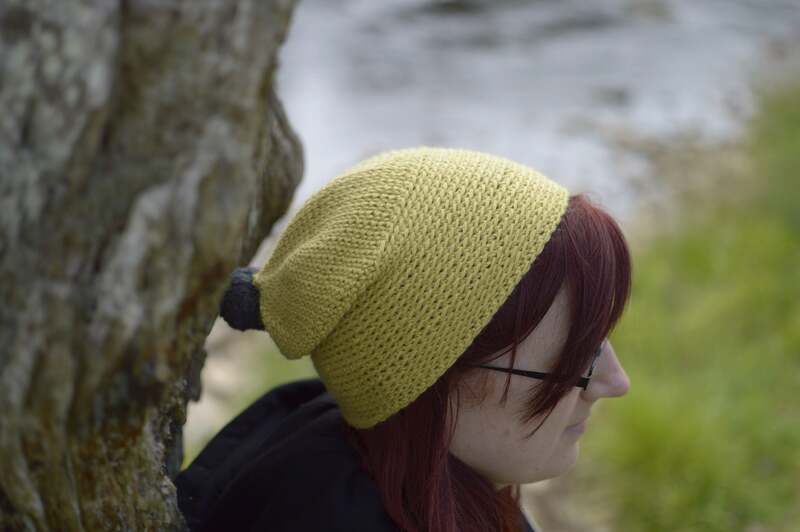 I found that the large size works as a slouchy hat, although it's meant to be a beanie really! It's shown here in Misty Woods. 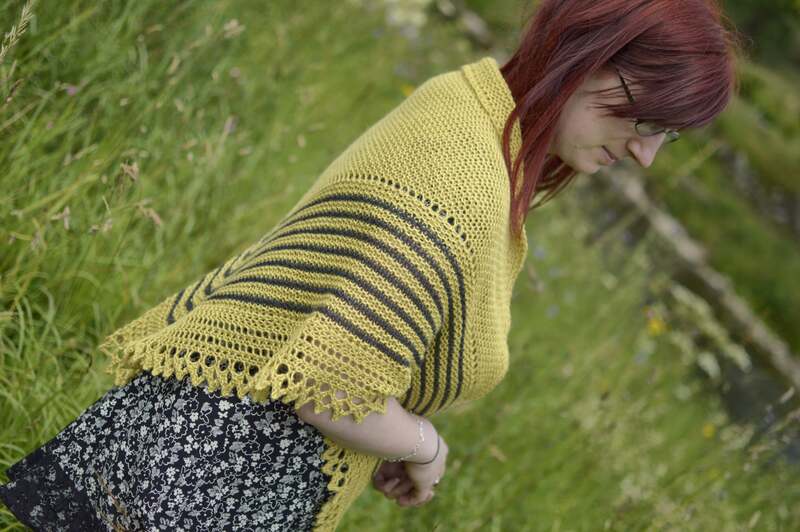 Embleton by Tracey Todhunter This is one of our crochet pieces, and (this goes for all the crochet) it's easy enough crochet for a knitter to pick up and do. I speak from experience! You'll need to check on how to do the stitches (which is in the pattern) but once you've done a few it's really easily memorable. The pattern is so adaptable as well - you can keep going until you run out of yarn and providing you have an idea of which hook size to use, you could use any yarn. It works well done in stripes too. It's shown here in Natural (which should be available from today). Oh and 'scuse the rain in the photo! Swale by Karina Westermann This is a proper hap shawl, with garter stitch body, stripes, and a lace border. 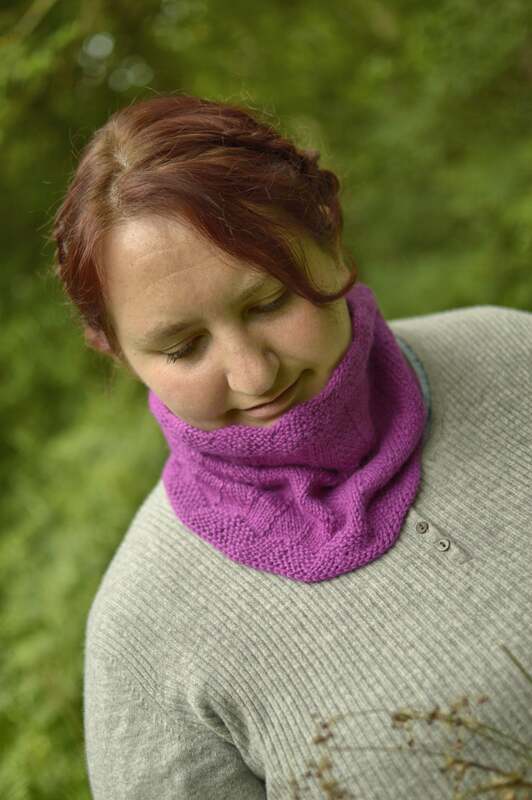 It's also a really decent size - large enough to really wrap around your shoulders, or to smush around your neck (see more pics on the Ravelry page). I like how it looks like a lovely warm shawl, which it is, but it's lovely and light to actually wear. The fabric is more delicate than you might think. It's shown here in Laburnum with Charcoal stripes. 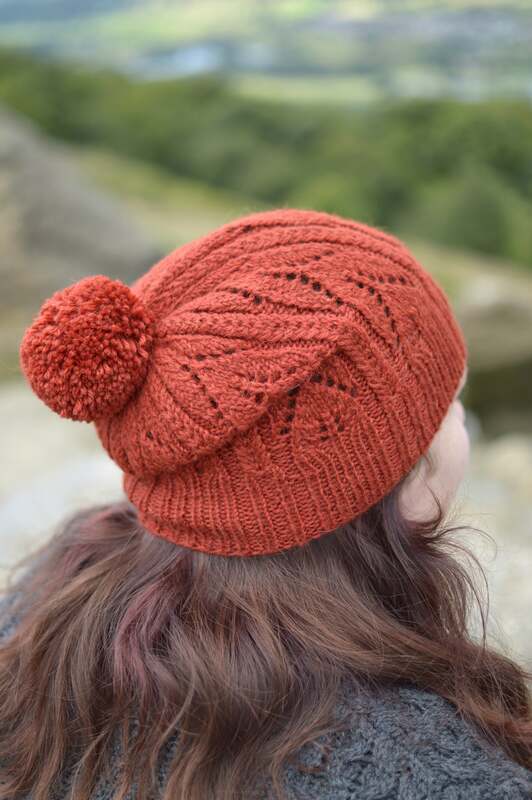 Bothel by Tracey Todhunter Another hat! We love hats! This one is crocheted, and has great slouch, plus tab or bobble options. We got photos of David wearing one in Charcoal, and it suits him really well, so it's very much unisex. 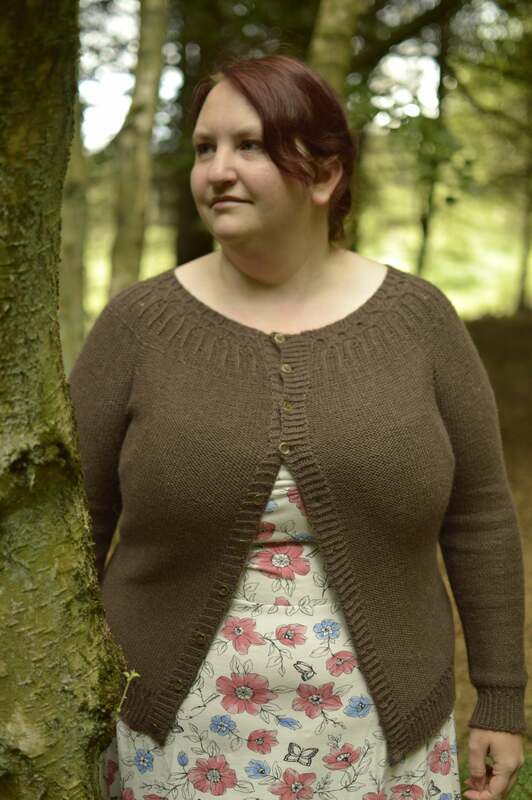 It's shown here in Laburnum, and there are photos of it in Ebony (dark brown) as well on the Ravelry pattern page. 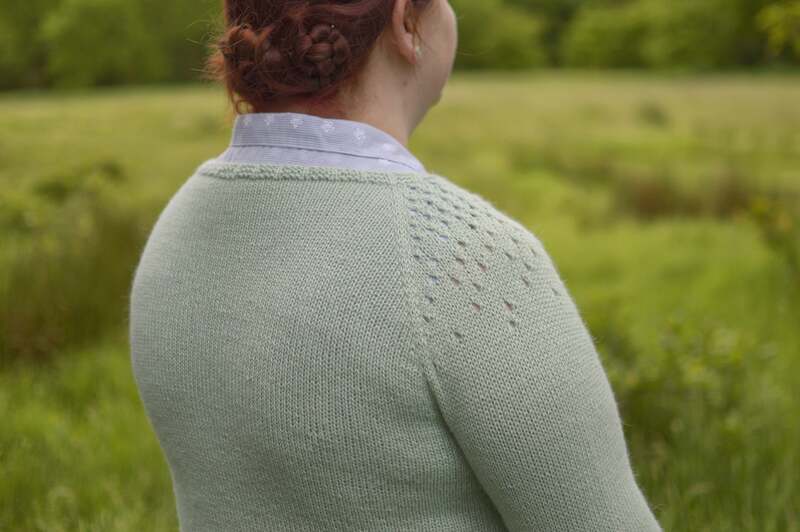 Turbine by Justyna Lorkowska This beautiful cardigan features subtle and really pretty detailing, and is incredibly flattering. I especially love it with a summer dress, although it was cold on our photoshoot (in July) and I ended up keeping it on anyway. 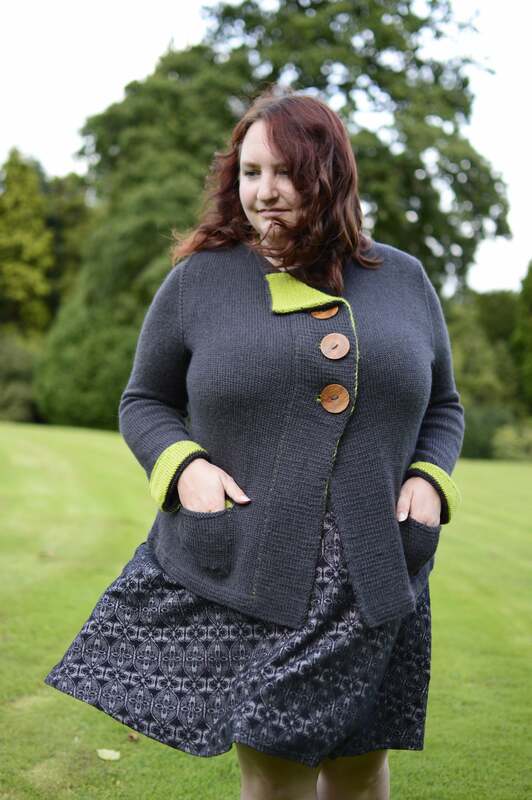 I love the fit of it - it's a round yoke but stays really well on my rounded shoulders (cardigans often don't). It's shown here in Ebony. 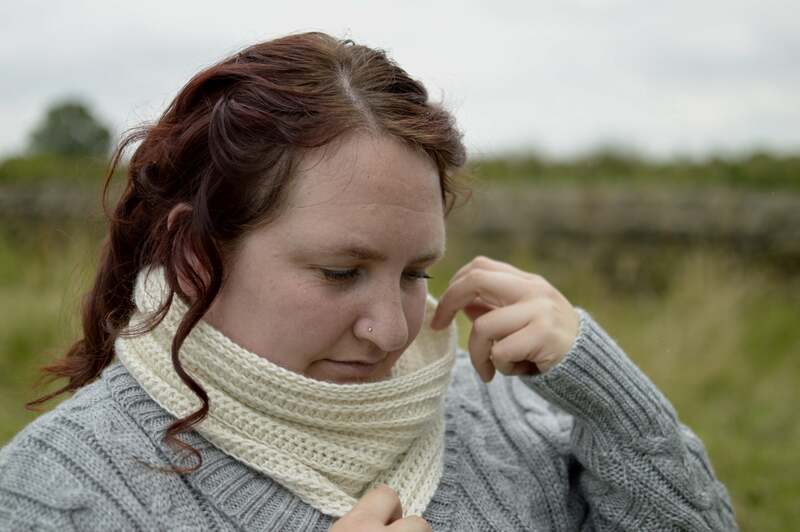 There are more (beautiful) photos from Justyna herself on the Ravelry page, which I'll show you when I give Turbine its own blog post (soon!). Caldbeck by Tracey Todhunter The third and final crochet pattern - again, this is unisex and we got photos of the larger size of these mitts in Charcoal on David (see Ravelry pattern page for now). As you can see here I added a stripe at the top of the small size mitts, but there's also the option for a ruffle around the cuffs. They're shown here in Misty Woods, with a Steel stripe (the Steel should be available from today). Ja Ja by Asa Tricosa This super-smart jacket features Asa's ziggurat technique, double knitting, and a neat tuck at the back to make it swing. It has very cool buttonholes as well, which provide a great opportunity to use three large and dramatic buttons (the styling works really well for that). I love the details, like the asymmetric turned up sleeve cuffs, and the pockets with contrasting lining. It's a relatively heavy garment to hold, but it feels perfectly light to wear, and I think the structure of it works amazingly well - it sits well on the shoulders (which as I mentioned earlier, is unusual for me), and it hangs really well. It's shown here in Charcoal as the main colour and Lichen as the contrast colour. Why we love Polwarth sheep and wool!